22nd Place in the 2000 ACM Programming Contest World Finals. Scientific computing and numerical analysis, with focus on intersection problems and optimization. 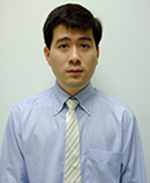 My research interest is numerical analysis / scientific computing with focus on continuous optimization and computer-aided design. Duangpen Jetpipattanapong and Gun Srijuntongsiri. A new pivot selection algorithm for symmetric indefinite factorization arising in quadratic programming with block constraint matrices. Chiang Mai Journal of Science, 45 (2), 1181-1193, 2018. Duangpen Jetpipattanapong and Gun Srijuntongsiri. New pivot selection for sparse symmetric indefinite factorization. Bulletin Mathematique De La Societe Des Sciences Mathematiques De Roumanie, 60 (1), 69-77, 2017. Online version. Gun Srijuntongsiri and Stanislav S. Makhanov. Optimisation of five-axis machining G-codes in the angular space. International Journal of Production Research. 53 (11), 3207-3227, 2015. Online version. Gun Srijuntongsiri and Stephen Vavasis. A condition number analysis of an algorithm for solving a system of polynomial equations with one degree of freedom. SIAM Journal on Scientific Computing. 33(1): 433–454. PDF. Online version. Gun Srijuntongsiri. An iterative/subdivision hybrid algorithm for curve/curve intersection. The Visual Computer. 27(5): 365–371, 2011. Online version. Gun Srijuntongsiri. Comparison of different bounding sets of polynomial functions defined in a given domain. Bulletin Mathematique de la Societe des Sciences mathematiques de Roumanie. Tome 54(102), no. 2: 185–191, 2011. PDF / Online version. Gun Srijuntongsiri and Stephen Vavasis. A condition number analysis of a line-surface intersection algorithm. SIAM Journal on Scientific Computing. 30(2): 1064–1081, 2007. PDF.Online version. Krich Nasingkun, Gun Srijuntongsiri, Thepchai Supnithi, and Mitsuru Ikeda. An ontology based tour design support to extend tourist’s cultural interest. International Journal of Knowledge and Systems Science, 8 (4): 1-16, 2017. Phyu, Seng Pan That Pann and Gun Srijuntongsiri. Effect of the number of parents on the performance of multi-parent genetic algorithm. Proceedings of the 11th 2016 International Conference on Knowledge, Information and Creativity Support Systems (KICSS 2016), 2016, pp. 188-193. Phyu, Seng Pan That Pann and Gun Srijuntongsiri. A binary coded multi-parent genetic algorithm for shuttle bus routing system in a college campus. Proceedings – 4th IGNITE Conference and the 2016 International Conference on Advanced Informatics: Concepts, Theory and Application (ICAICTA2016), 2016, 5 p.
Tun, Zin Zin and Gun Srijuntongsiri. Myanmar digit speech recognition using cross-language acoustic models. Proceedings – 11th International Symposium on Natural Language Processing (SNLP-2016), 2016, 6 p.
Tun, Zin Zin and Gun Srijuntongsiri. A speech recognition system for Myanmar digits. Proceedings – 2016 SCIEI February Nha Trang, Vietnam Conference Proceeding: Proceedings – 2016 8th International Conference on Computer Research and Development (ICCRD 2016), 2016, pp. 50-53. Gun Srijuntongsiri and Stephen Vavasis. Properties of polynomial bases used in a line-surface intersection algorithm. Lecture Notes in Computer Science 6067 LNCS (PART 1), pp. 369–378. Gun Srijuntongsiri. Finding all intersections between planar curves. Proceedings – International Conference on Electrical Engineering/Electronics Computer Telecommunications and Information Technology (ECTI-CON), 2010, pp. 1241–1244. Gun Srijuntongsiri. A subdivision/iterative hybrid algorithm for finding all roots of a system of polynomials. Proceedings – International Conference on Information and Communication Technology for Embedded Systems. January, 2010. Duangpen Jetpipattanapong and Gun Srijuntongsiri. An efficient heuristic method for large scale block diagonal quadratic programs. Proceedings – 2nd EURO-SIAM Conference, 2011. Wongsakorn Nitisopa and Gun Srijuntongsiri. Improving trading strategies by optimizing the weighted combination of different trading strategies. Proceedings of the 17th WSEAS International Conference on Applied Mathematics (AMATH '12), 2012, pp. 79–83. Thun Chitmaitredejsakul, Sanparith Marukatat, Surapa Thiemjarus, Gun Srijuntongsiri, and Hiroaki Kunieda. Multiple Objects Monitoring Based on 3D Information from Multiple Cameras. Proceedings – The 2014 International Electrical Engineering Congress (iEECON2014), To appear. Wongsakorn Nitisopa, Pitak Eiamchai, Shuichi Uenoy, and Gun Srijuntongsiri. Optimizing Parameters of Trading Strategies by Simulated Annealing. Proceedings – The 4th International Conference on Information and Communication Technology for Embedded Systems (IC-ICTES 2013), 2013. Thun Chitmaitredejsakul, Sanparith Marukatat, Surapa Thiemjarus, Gun Srijuntongsiri, and Hiroaki Kunieda. Multi-Camera Based Human Position Tracking. Proceedings – The 4th International Conference on Information and Communication Technology for Embedded Systems (IC-ICTES 2013), 2013. N. Chuenchomphy, C. Nopparat, and G. Srijuntongsiri. Optimizing portfolio of SET stocks using convex quadratic programming. Proceedings – International Conference on Electrical Engineering/Electronics Computer Telecommunications and Information Technology (ECTI-CON), 2010, pp. 676–678. Satjaporn Tungsong and Gun Srijuntongsiri. Index arbitrage and futures pricing efficiency: evidence from Thailand. Proceedings – 24th Australasian Finance and Banking Conference, 2011. Satjaporn Tungsong and Gun Srijuntongsiri. Applications of conic optimization and quadratic programming in the investigation of index arbitrage in the Thai derivatives and equity markets. Proceedings – ICORFE 2010 International Conference on Operations Research and Financial Engineering, 2010. Gun Srijuntongsiri and Stephen Vavasis. A condition number analysis of a surface-surface intersection algorithm. SIAM Conference on Geometric Design & Computing, San Antonio, TX, November 2007. Gun Srijuntongsiri and Stephen Vavasis. Fully sparse semidefinite programming using automatic differentiation. ICCOPT II, Hamilton, ON, Canada, August 2007. Gun Srijuntongsiri and Stephen Vavasis. Condition-number analysis of an algorithm for finding all polynomial roots. SIAM Conference on Geometric Design & Computing, Phoenix-Mesa, AZ, October 2005. Gun Srijuntongsiri and Stephen Vavasis. A primal-dual potential reduction method for semidefinite programs with sparse data. INFORMS, Denver, CO, October 2004. SIAM Conference on Geometric Design and Computing, San Antonio, TX, November 2007. Co-organize with Stephen Vavasis.